The writer on contemporary political fiction, his favorite court decision, and why he values ethics over empathy. The dominant mode of American short fiction is a timeless portrait of a particular person in a particular milieu. After reading hundreds of these stories one begins to recognize the nods toward posterity, which deaden whatever effect the writer intended. Happily, the eleven pieces comprising Joseph O’Neill’s Good Trouble (Pantheon)— many of which first appeared in Harper’s and The New Yorker— succeed through an opposite approach. O’Neill writes with an urgent timeliness, as if these stories were written yesterday, with the politics and news you might have shared with your friends this very morning. The thrill of seeing the here and now transmuted into morally serious and comically rich prose is heightened once you realize its rarity. O’Neill is the author of a memoir and four novels, most notably Netherland and The Dog. 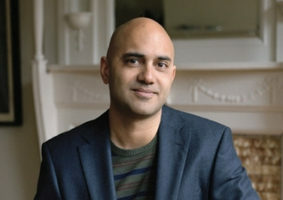 He is a living rebuke to Fitzgerald’s claim about second acts, having left a career as a barrister for one of writerly success (the PEN/Faulkner award; an Obama co-sign) and enviable teaching gigs (Bard College). He has a talent for dissecting the self-defeating and comic/tragic hypocrisies of the educated Western male. In “Pardon Edward Snowden,” a poet wrestles with a more famous colleague’s request to sign the titular poem-petition, which spirals out— O’Neill’s characters are forever spiraling— into a meditation on art’s ability to foment justice, and seesaws between postmodernism fatigue (there’s nothing new under the sun, including meta-commentary about there being nothing new under the sun) and Adorno-esque pessimism (why even bother creating art in the face of such strife?). In “The Poltroon Husband,” a character’s utter failure to respond to his wife’s inquiry about a bump in the night becomes a (possibly imagined) crucible he must take greater and greater steps to overcome. The author and I conducted the following interview over email shortly after the publication of Good Trouble. Guernica: In The Dog, your parenthetically rich sentences had a pyrotechnical, unspooling aspect to them which didn’t appear in Good Trouble. (And for that matter might never work in the compressed form, outside of perhaps something like David Foster Wallace’s “The Depressed Person.”) Do you approach the sentence in your short stories differently than in the novels? Joseph O’Neill: I do approach it differently. The short story sentences are more to-the-point, more denotative— maybe have a greater tendency to “tell” the story, particularly if there’s a third-person narrator. Whereas the novels are all told from the first-person point of view, and there’s a lot more scope for letting the sentences connote something about the narrator, rather than about his ostensible subject. On the other hand, a very voicy short story can also work, even if told in the third person. It’s all pretty intuitive, of course, and dependent on the tone, which varies from story to story. Guernica: Nabokov said his novels started with a “throb,” a kind of general feeling he chased in the composition. Your stories feel as if they began similarly, possibly from a Larry David-esque, real-life awkwardness (especially “Pardon Edward Snowden” and “The Trusted Traveler”). Is that true? You’ve mentioned some of the stories were written quite quickly. At the risk of raising the ire and envy of other writers: does the short fiction come relatively easy for you? Joseph O’Neill: I keep a file of short story-related ideas— some incident, some situation, usually amusing in some way. The ideas will sit there for a while, sometimes up to a year. Then I’ll notice that two of them, unrelated when I wrote them down, resonate with each other even as they involve no apparent connection. You mobilize the two ideas and you have a story that is structurally surprising. For example, in “The Mustache in 2010,” which is about this exact moment in American history and its helplessness and darkness, started with two unconnected ideas: a school auction, and a guy who shaves himself a joke Hitler mustache. The more unforeseen the combination, the greater the likelihood that the story itself will involve the unforeseeable. I wouldn’t say short fiction comes easily to me. Not at all. I tend to write it quickly, but that’s only after a long gestation period. But it’s true that I don’t labor at those stories as I do with writing novels, which I always find a daunting, draining, speleological business. The mouth of the cave is always in sight when you’re writing short, which means that there’s a lot of adrenaline involved. Guernica: Adrenaline’s a good word for it. There’s certainly an energy on the reader’s side, a kind of buzzy propulsion to “The Sinking of the Houston,” “The Referees,” and “The Poltroon Husband” in particular. Joseph O’Neill: Speaking for myself— and I’m just a reader of these stories, at this point— I don’t think the narrator is apathetic towards his former student. He can’t remember the guy, and can’t quite understand why, of all the people in the world, this is the guy he must give his precious time to. It makes his life feel random. The quest for the opposite of randomness— coherence, maybe—preoccupies the narrator, and as you say, he tries to deploy language, the human tool for knowledge, as a way of describing things into coherence. This is about as successful as one could expect. As you’ve observed, knowledge of the world does not necessarily enhance one’s ability to connect to others— although surely it can do no harm, right? Ignoramuses are not exactly famous empaths. Guernica: The reach toward empathy runs through several of the stories: your characters are often jostling with strangers from different backgrounds and different political beliefs. Collectively, the stories shout: Battle complacency. Engage. Was this a conscious idea in your writing, or did it emerge more subconsciously? Joseph O’Neill: Politically, I’m not a huge believer in empathy. I’m more of an ethics person. Empathy is unsystematic and short-lived, like all emotions, whereas principles of right and wrong, just and unjust, (supposedly) endure irrespective of how we happen to feel from day to day. The same applies to literature: obviously one must write with empathy, because without it you’re going to produce characters that are false or inert. But I didn’t have in mind the idea that these stories should promote empathy, or indeed that the characters in them are in particular need of empathy. These are, for the most part, bourgeois American men and women that we’re reading about. They don’t lay a greater claim to one’s compassion or understanding than anyone else, and in fact they probably have a weaker claim than most, because they’re all set, in theory. But they happen to be the people I feel I can write about with maximum authority— and they happen to be involved, these genteel and bourgeois Americans, in a humanistic experiment no less crucial and radical in its implications than the experiments historically conducted by communists, royalists, rebels, or what have you. The revolutionary dimension of the liberal American project, in particular its current emphasis on the egalitarian deconstruction of gender, sexuality and race categories, is very much under-appreciated (unless you’re a Trumpist, ironically). To write about the American bourgeoisie is, in this sense, to write about revolutionaries. Of course, the revolutionaries themselves are as fallible and confused and unwitting as everyone else. And that drama, that struggle, is of interest to me— how ostensibly enlightened specimens of humanity fail and succeed in achieving a transcendence they’re almost unaware of. Now, recent political events have flushed this all out quite distinctly. And I think that half of these stories were written in the last two or three years and are pressured, in some cases quite consciously, by the rise of American illiberalism and the predicament of those seeking to challenge that. Although it’s a bit unglamorous to point it out, this country’s democratic prospects depend precisely on the ability of the bourgeoisie, in alliance with largely working-class minorities, to construct an effective political movement. The female bourgeoisie in particular. Pink-hatted women of a certain age are the new heroes— not college students, not Trotskyites. “Good Trouble” is the catchphrase of John Lewis, and his spirit haunts many of these stories, directly or indirectly. By contrast, my novels (Netherland, The Dog, and the one I’m working on now) are globalistic in a way that these stories aren’t intended to be. All sorts of ideologies, societies, and nationalities pop up— West Indians, Indians, Arabs, Africans, Americans, Englanders, Irelanders, Netherlanders, etc. I guess I must think that it’s more doable to work with international, multiethnic materials in the longer form. In the shorter form, I seem to gravitate toward a certain demographic consistency, a certain kind of investigation. Guernica: If I’m being honest, I misread certain aspects of these stories the first time around in Harper’s and The New Yorker: through their comic aspect and a narrower lens of “the way we live now.” Are you optimistic with regards to the greater liberal project? Joseph O’Neill: Optimistic wouldn’t be the word that springs to mind. And I don’t think you misread the stories. That stuff I just said is simply my personal take on the stories, not a prescription for how to read them. “The way we live now” is a perfectly valid lens. Guernica: Do you ever miss practicing law? Joseph O’Neill: I used to miss it quite a lot— the camaraderie, those rare moments in court when it all goes well, the buzz of unspooling a thread of logic. I did it for almost fifteen years, after all, and that’s not counting years of studying law. To this day, I enjoy reading Supreme Court judgments— in the UK as well as the US— and I keep in touch with old pals. But at this point it’s a past life, even if the habits of mind I developed over those years still remain. Guernica: I’ve heard Justice Ginsburg’s dissents are a thing of beauty, and I’ve hate-read a handful of the late Justice Scalia’s opinions. Any favorites of your own? The appellants, Earl Pratt and Ivan Morgan, were arrested 16 years ago for a murder committed on 6th October 1977 and have been held in custody ever since. On 15th January 1979 they were convicted of murder and sentenced to death. Since that date they have been in prison in that part of Saint Catherine’s prison set aside to hold prisoners under sentence of death and commonly known as death row. On three occasions the death warrant has been read to them and they have been removed to the condemned cells immediately adjacent to the gallows. The last occasion was in February 1991 for execution on 7th March; a stay was granted on 6th March consequent upon the commencement of these proceedings. The statement of these bare facts is sufficient to bring home to the mind of any person of normal sensitivity and compassion the agony of mind that these men must have suffered as they have alternated between hope and despair in the 14 years that they have been in prison facing the gallows. It is unnecessary to refer to the evidence describing the restrictive conditions of imprisonment and the emotional and psychological impact of this experience, for it only reveals that which it is to be expected. These men are not alone in their suffering for there are now 23 prisoners in death row who have been awaiting execution for more than ten years and 82 prisoners who have been awaiting execution for more than five years. It is against this disturbing background that their Lordships must now determine this constitutional appeal and must in particular re-examine the correctness of the majority decision in Riley v. Attorney-General of Jamaica  1 A.C. 719. Guernica: As an American it’s sobering to read any judge’s statement that takes into account the emotional and psychic toll such treatment engendered. Our own system’s inhuman, punitive, and capitalist approach seems determined to snuff out any rehabilitation. There have been a few excellent novels on the carceral state, such as Mitchell S. Jackson’s The Residue Years and Rachel Kushner’s The Mars Room. Have you read any recent fiction that you feel engages with the berserk-ier American berserk? Joseph O’Neill: To be honest I’m too busy following the berserk in nonfictional media. It will be interesting to see how writers will deal with current events. There are so many aspects to consider. Guernica: Last question: who are you rooting for in World Cup? I was pulling for Iceland, but I know just enough to keep up with my football-fanatic friends. Joseph O’Neill: Holland and Ireland aren’t playing, so I find myself rooting for England. I have a soft spot for France and Mexico, too. I loathe the Russia team. Ryan Chapman lives in Kingston, New York. He has written for BOMB, GQ.com, Electric Literature, Buzzfeed, Longreads, and elsewhere. His novel Riots I Have Known (Simon & Schuster) will be published in 2019. Why do you have to separate ethics from empathy? Or is this only in your stories for lack of space? Both need to be practiced daily but usually for different reasons and/or situations. How can one not be empathetic toward the “caged children” separated from their parents who have done nothing wrong. Most of their parents haven’t either. They came looking for survival and therefore amnesty–or don’t you believe in our user of amnesty as a form of ethics? Ethics is mostly the use of the Golden Rule in terms of society–a neighborhood, business, or the world. Or are you calling ethics legality so no one has the right to step over our border for any reason. They belong–down there!!?? The American bourgeoisie are the collaborators. Like Mathilde Loisel in de Maupassant’s story The Necklace, their world is made of paste. O’Neill’s smug narcissism is unforgivable.